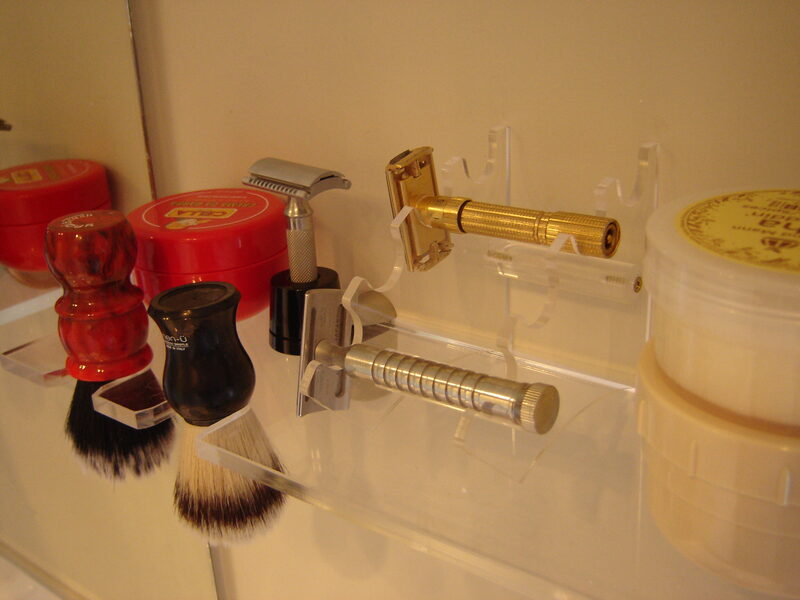 Razor stand and Shelf ideas. 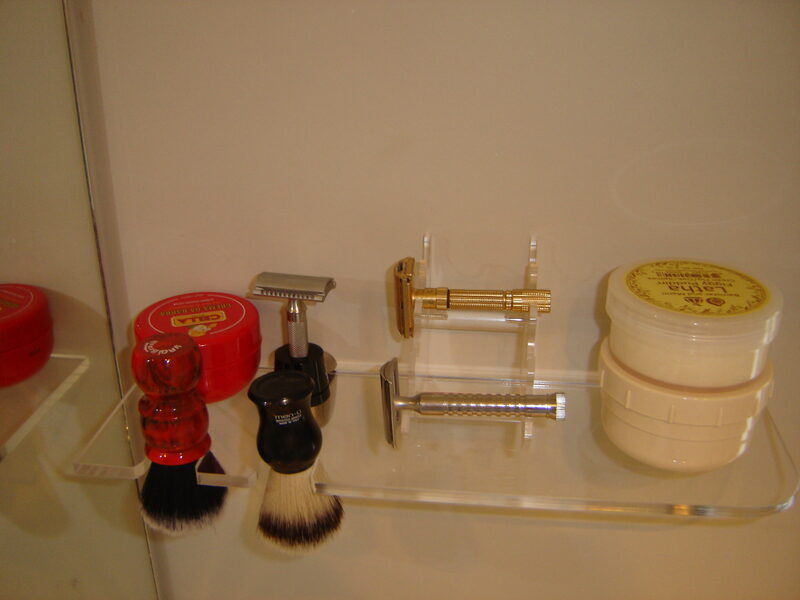 Firstly, a view of my razor shelf. Made from 8mm thick acrylic sheet (yes, you can use some alloy plate or similar for that 'industrial look'). 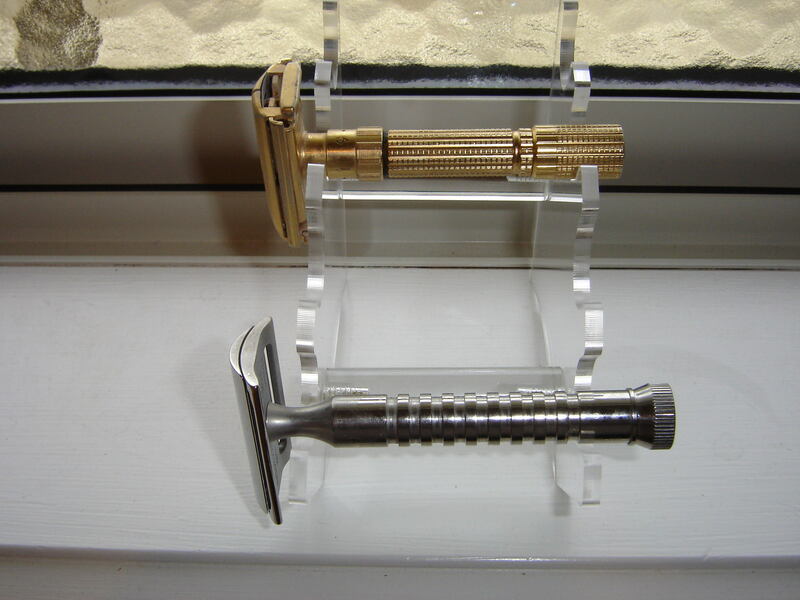 Then my razor stand. I bought it from ebay, and altered it a tad so it would fit my shelf, and narrowed it to fit my razors. Width is now 70mm. I bunged in a shelf plan for those of you who might need one. 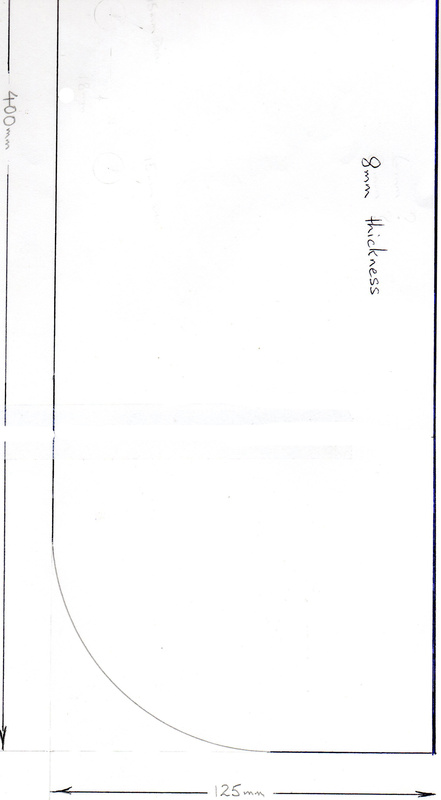 You will have to print it out and match up the writing to get the correct size (my scanner is small and needed 2 passes to scan the whole thing). Obviously make size adjustments to suit your requirements. I ended up with the first brush cutout at 40mm in from the end because the plastic guys cut it wrong, but I'm happy with that anyway. 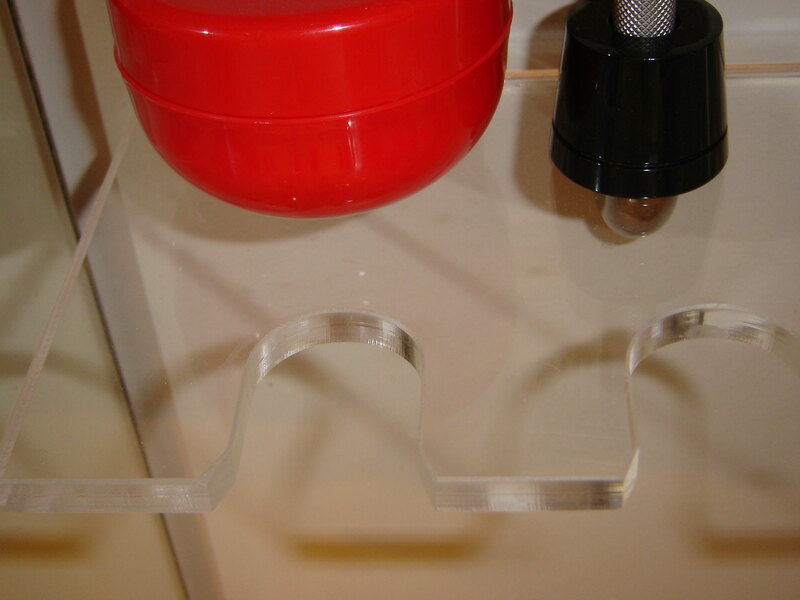 You could drill a few holes through the acrylic shelf and just drop your razor handle down there. That was my original plan, but I liked the e-cigarette stand better. You can see where I cut down the small ebay stand. That stand is for e-cigarettes! Oh yeah... SS Mamba, Fatboy Executive, Ikon 101 plus TOBS Grapefruit, Figgy Puddin', and Cella. Good work @Blackie, looks like a good project for the Xmas holidays! That eBay seller looks to be out of stock.... try this place for stands, good prices with lots of choice. I've spent more at fasttech on vaping stuff than I'd care to remember being off the analogues for several years now. Thanks Scotty, I bought my stand a few weeks ago. Maybe I bought the last one! Ebay does have a heap of sellers with those stands...I just chose the cheapest option (I saved a whole 50cents!!!). These are similar to what I used. Looks like metal supports, otherwise the acrylic sides look the same as mine. 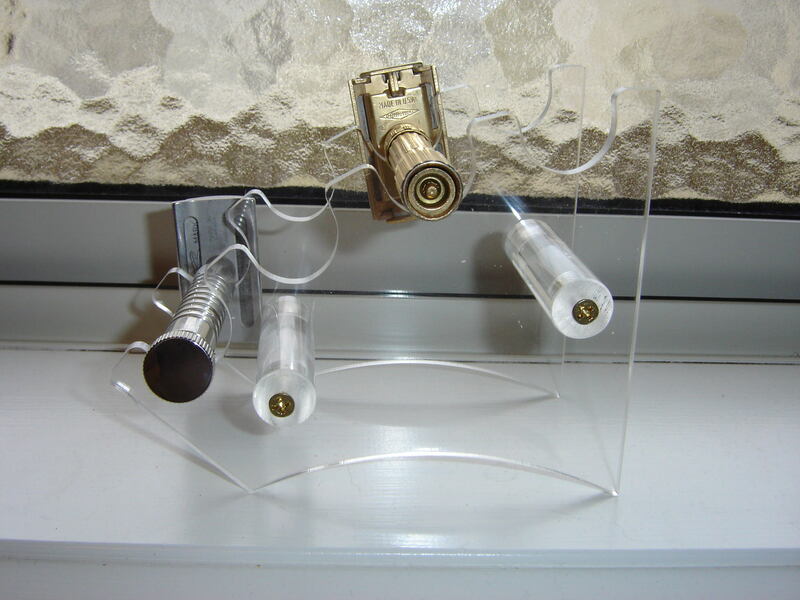 The shelf is held by these gadgets. This gives me lots of ideas. Well mate, you will need some extra spaces to hold everything now. 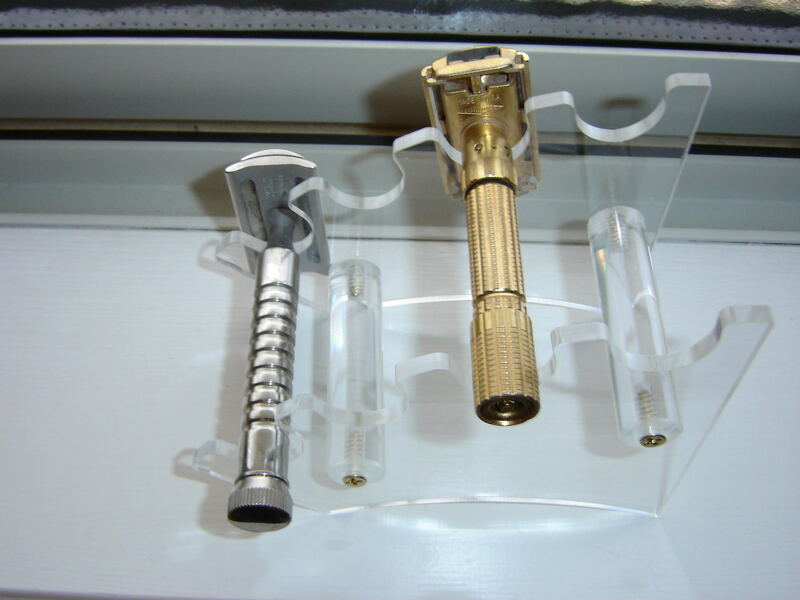 A Gillette NEW would look great sitting on that acrylic stand. As it turns out I MUCH prefer the New to the R41. It's like night and day! ... Now I just need to find a nice stand for it. resurrecting an old thread here.... @Blackie - any chance you can give me an indication of how much your shelf cost (inc cutting)? Using your measurements (more or less) and adding a few extra brush holder holes I've drawn my own up and just been quoted around AUD$95 to supply/cut, which I cant help thinking is taking the pi$$ somewhat. @no47 they are taking the piss alright. Mine was $18NZ total. I gave the local plastic guy the plan, went back a few hours later and all done. Nicely cut out, and polished edges. @Blackie , thought as much, thanks for the reply mate. Ill look elsewhere and see if I can get a more 'reasonable' quote. Any of our WA people recommend anywhere (pref NOR)? Cheers. @no47 that's a nice looking shelf. Can we see some photos when it's 'up and running'? 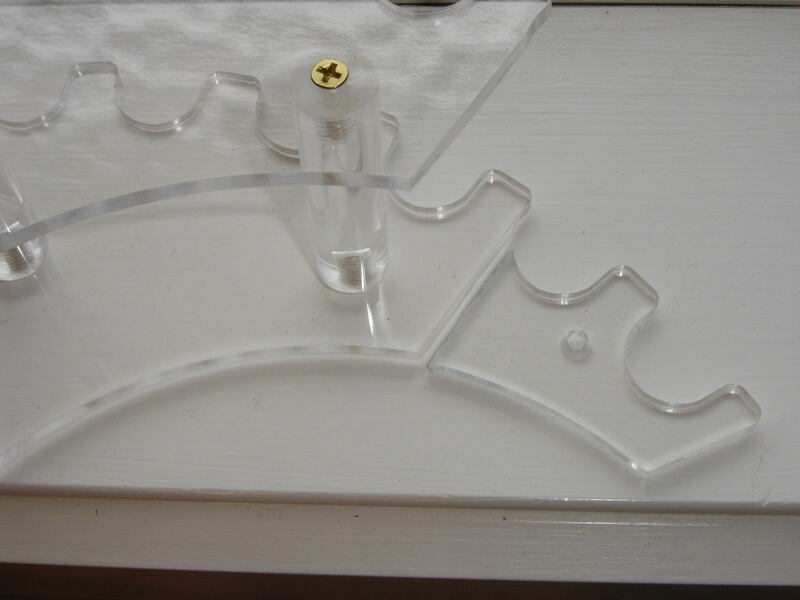 Could you just buy some acrylic and cut it out yourself? Or maybe alloy, deck plate, etc? That's a distinct possibility at the moment. @no47 would you consider getting this 3D printed? I have no idea how much it would cost, but I could model it up for you and give you a file to send around for some quotes. You could even give shelf a honey comb pattern or something to cut down on printing material. That would look pretty good as well I think. @LukehGee - I'm not set on any specific material so 3D would certainly be an option, and Id be more than happy to accept your offer of modelling it up, that would be brilliant - thanks! @no47 no worries. I'll do it tomorrow for you after work. I don't have any drafting software installed at home otherwise I'd do it now for you. Can you PM me your email address. Made it yet, any piccy's? Not as yet mate sorry. Costs associated with the options considered were just astronomical. Ive not given up on it, but it will be a home made effort that gets produced.....its on my list, its just that SWMBO has a lot of decorating/diy jobs on the list for me first.